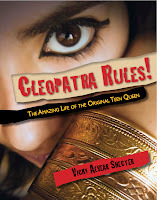 Ancient Egypt, Rome and Greece: I'm Giving Away Copies of CLEOPATRA RULES! 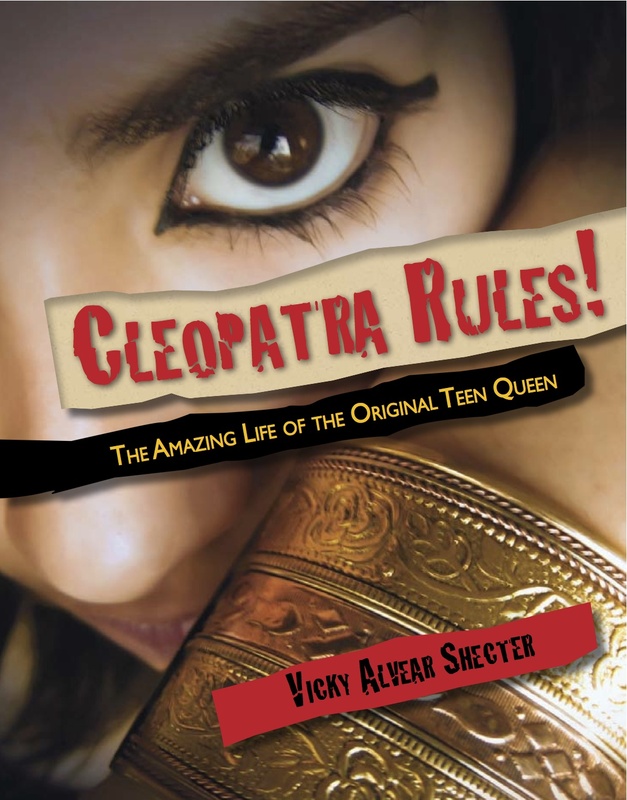 I'm Giving Away Copies of CLEOPATRA RULES! No, what I want you to do is...(drum roll please)...leave a comment. Yup, that's it! Only one comment per person, please. However, I will double your entry if you follow this blog. Just click the "Follow" button toward the end of this page to make it official. I'll triple it if you also follow me on Twitter and friend me on FB (lower right buttons). The Queen of the Nile awaits your request for her royal presence. So get typing, commoner! Contest ends September 30. I can't wait to read this! Anyone who can combine humor, historical accuracy, and in-depth research is awesome, so I'm sure this book will become a favorite. What... A chance to win something not only neat but useful too? I'm a follower (naturally). I'm also going to give you a shout-out on my blog post tomorrow. My god-daughter is really fascinated with all things Egypt now. I think this will be perfect for her. well I didn't read all of your post... so you can send my copy to the Lauderdale County Jail... only kidding... but it did sound like a good plan only I was going to ask for twenty thousand, ten for you ten for me. Ok, put me in for three chances to win. Vicky, What an awesome opportunity to see your new work!!! Thank you for bringing Classics to life!! Sounds like a great read. Looking forward to it. Many blessings. Hi Vicki, This book looks so fantastic, I can't wait to read it! Like Narukami, I'm in all the way: comment, follower, fb friend. I loved your Alexander book and can't wait to read this one! I've signed up to follow your blog, added you to facebook and now I'm leaving a comment. I do hope I win! If I don't I'll just the book. I've been looking forward to reading it. Looking forward to seeing you at the conference too. Yay! I want a copy!! I never win contests, but here I am anyway. I love the photo of you dressed as Cleopatra, Vicky. The kids must have a blast when you come for school visits. The cover just cries out -- pick me up and read me quick! Okay, sister, I FB friended you, followed you on Twitter, re-tweeted your giveaway AND I follow you here. Plus, I'm commenting. Um, I just realized that I sound kind of like a stalker. Which I'm not. Unless that would count for another point in winning your book. Sounds like you know your ancient sources. Hope, for my 6th-graders sake, that you also tell your readers that Cleopatra's family was Greek, not Nubian. And "on the souls of their feet" needs "soles." Otherwise, cool. I was so intrigued by your book when you first mentioned it, I searched the library for anything like it. I can hardly wait for your book. I got over here from your midsouth listserv post. What an entertaining blog! The whole duck fat post was great. I hope to meet you at the conference! This looks like a great read! I love to learn something new while engrossed in a "can't tear me away" story! Love me a contest! I'm already a follower and FB friend, joining Twitter now and this is my comment! Oh yeah, Happy New Year and an easy fast today! Wish I had history books as interesting as yours when I was young! Congrats on your book, Vicky! I'm a librarian in my hometown public library, as well as an author and illustraotor. I would love to win a copy of "Cleopatra" for our children's department! Enter me in the contest, or you'll never see Yacky again. Oh, and Yacky wants to know if he can enter, too. I can't wait to get my copy! Thanks- popped over from SCBWI listserve. Hope to rendezvous at the conference! I'm off to "like" you on FB now... * gasp * I don't Twitter. WREverdell - that will be eye-opening for many! :) Seems like she was a Ptolemy wasn't she? This book sounds amazing! I love historical fiction and YA--this is a winning combination. Please count me in. I love your costume!! Very cute. This looks like something I would enjoy. Oh cool! This book sounds right up my alley and then some, lol. Enter me, please! Ohh I totally want that, cause she DOES RULE!! I would love to read this book, it sounds very interesting. Really want to read this! I'm reading When We Were Gods: A novel of Cleopatra, and I'm so loving it. This is right up my alley. Thanks for offering this up for a giveaway. Your book looks very interesting! I'm a follower on your blog on GFC and on Twitter as @elliottreview. Thanks for offering up a good looking book! I'm a follower. I would love to read this. Awesome book! Please count me in if this is international. This looks like a great read! I love the blend of YA and history, and your pic is great too! Thanks for the info and chance to win! You can triple me... follow blog, follow Twitter, and just added you on facebook! Sounds really good! xD Count me in if it's international, please! I love history in any form! If this is international please count me in. This sounds like an awesome book! I'm really intrigued - I've always liked reading about royals and history. Looking forward to adding this book to my library's collection! I love historical fiction. I would really like to read this. What fun, I wanna win! I would love to be entered in your draw. Sounds fabulous! Count me in please. Yeah, she rules! I follow you and would love to read this! Sounds like a wonderful book! History is definitely a twisted sort of thing. Sounds like Vicky has done a perfect job or unraveling enough of it to provide a whole new perspective on Cleopatra. Congrats on all the great reviews. Can't wait to read it. History is definitely a twisted sort of thing. Sounds like Vicky has done a unraveled enough of it to provide a whole new perspective on Cleopatra. Congrats on all the great reviews. Can't wait to read it. I'd love to read this book! I'm a GFC Follower. Fingers crossed! I'm also a follower and a friend on facebook! My Latin students would enjoy this book. I am looking forward to receiving it. I would love to be entered for this. Thanks! Just finished watching HBO's "Rome" series, so I'm intrigued by a new perspective on Cleopatra. Best of luck with your book! I heard a report on NPR yesterday about a new adult book on Anthony and Cleopatra. I kept thinking about this book, and will be excited to read both! Hope it's wildly successful! I can't wait to read your book! I too, am so looking forward to this book. I love historical with contemporary feel in books.